Let's face it: We can all be a little absent-minded sometimes. But aside from constantly losing your keys, the other thing that everyone is always misplacing is their phone. On Thursday, Lookout launched a nifty interactive report that shows you where and when people are losing their smartphones. 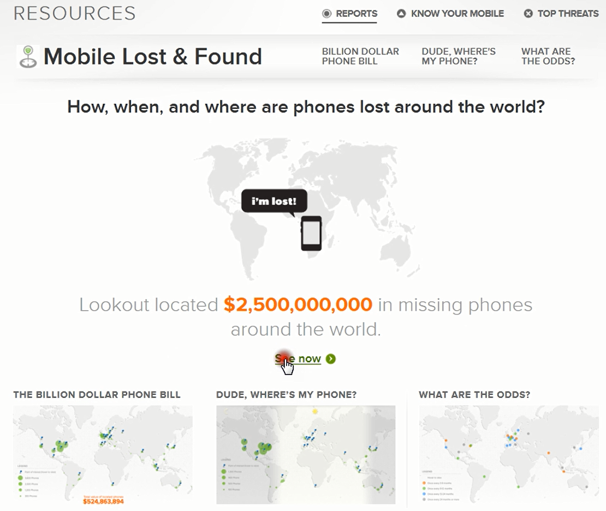 The report, titled "Mobile Lost and Found," shows you a map of the world and the cities where billions of dollars' worth of phones have been lost and found over the past year. In the United States alone, the dollar amount of phones recovered was in the millions. While the report at the moment only shows major cities, it still provides some interesting insight into which cities people are most likely to lose their devices and where in those cities people are losing track of their phones. For instance, people in San Francisco were most likely to lose their phone in a coffee shop while people in Atlanta were most likely to leave their phone in their office. Lookout will even breakdown the chance that you'll lose your phone, depending on where you live. Aside from pushing Lookout's mobile security app (which is one of the few mobile security apps that actually works), the report provides a great visual for how many phones are lost on a yearly basis. So the next time you're in Philadelphia, be sure to keep a tight grip on your phone.